The Tour is coming! The Tour is coming! Ever since last fall when it was announced that the Tour de France would be returning to this area, local officials and business owners have been preparing for an onslaught of visitors. 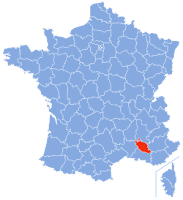 According to some estimates the department of Vaucluse (English link) could see an influx of 500,000 people, just about doubling its population. Local business owners have been told to stay open extra hours to handle the hungry, thirsty throngs. Politicians have been figuring out the nitty gritty of dealing with so many people: how to get enough portable toilets in place; when to block, divert traffic; how to make sure the path is clear; where to put all the cars, trucks, buses that will accompany race fans. In our village a pre-Tour (see below) will, gasp, be coming through right on market day. The riders will be filling the main, market, street. What to do? No thought at all of cancelling even for just that one special day. Plans have instead been made for a one-time relocation. All this planning is being done willingly, though. These are tough economic times and the Tour’s fans bring with them euros to spend, euros the local promoters of tourism will be pleased to receive. Mt. Ventoux is well known to riders everywhere. Last Fall, in an Albany New York wine store a sales representative was offering samples, including a Côtes de Ventoux. When I told him I would be living in the area for a semester, the first thing he mentioned was cycling. 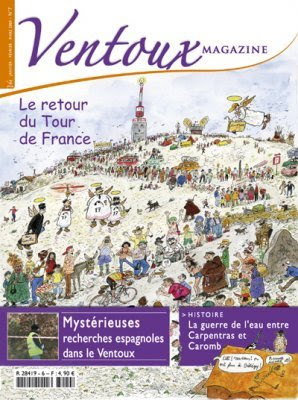 Ventoux, the “giant of Provence,” has even exacted its own human sacrifice. In 1967 British rider Tom Simpson died while climbing Ventoux, a victim of heat, exhaustion, dehydration and amphetamines. Mourners at Simpson’s funeral included the great Belgian rider Eddy Merckx who, one year, after winning the Ventoux stage, had to recuperate at a medical station before he could take his place his place on the podium. This year, not only will the riders on the Tour itself take on Ventoux, but, five days earlier another ride will take place. This one is called L’étape du Tour Mondovélo. It’s an opportunity for amateurs to take on the challenge. Some 9500 enthusiasts are expected to ride on July 20. Organizers are hoping for better luck than the last time l’étape Mondovélo took on Ventoux. 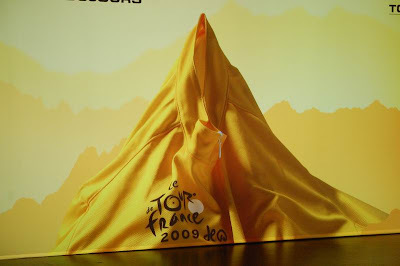 In July 2000 the event had to be halted because of near freezing temperatures and hail as riders approached the summit. For our village, pathway to Ventoux, the biggest pre-race change has been newly paved streets everywhere. On July 20 the main one will be set aside for the étape. A few blocks away, at the relocated outdoor market, others will be buying their weekly store of vegetables and cheeses. Some of them, no doubt, will look forward to the post-Tour peace and quiet that drew them here in the first place. I left you an important message on facebook.